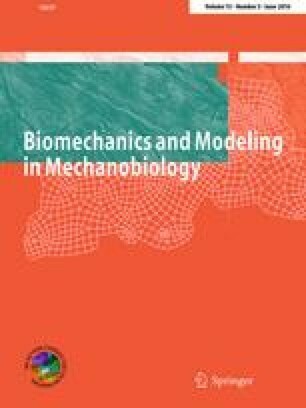 Recent studies have shown that mechanical stimulation, in the form of fluid perfusion and mechanical compression, can enhance osteogenic differentiation of mesenchymal stem cells and bone cells within tissue engineering scaffolds in vitro. The precise nature of mechanical stimulation within tissue engineering scaffolds is not only dictated by the exogenously applied loading regime, but also depends on the geometric features of the scaffold, in particular architecture, pore size and porosity. However, the precise contribution of each geometric feature towards the resulting mechanical stimulation within a scaffold is difficult to characterise due to the wide range of interacting parameters. In this study, we have applied a fluid–structure interaction model to investigate the role of scaffold geometry (architecture, pore size and porosity) on pore wall shear stress (WSS) under a range of different loading scenarios: fluid perfusion, mechanical compression and a combination of perfusion and compression. It is found that scaffold geometry (spherical and cubical pores), in particular the pore size, has a significant influence on the stimulation within scaffolds. Furthermore, we observed an amplified WSS within scaffolds under a combination of fluid perfusion and mechanical compression, which exceeded that caused by individual fluid perfusion or mechanical compression approximately threefold. By conducting this comprehensive parametric variation study, an expression was generated to allow the design and optimisation of 3D TE scaffolds and inform experimental loading regimes so that a desired level of mechanical stimulation, in terms of WSS is generated within the scaffold. The authors would like to acknowledge the research grant from European Research Council (ERC) under grant number 258992 (BONEMECHBIO). In addition, F. Zhao wishes to thank M. J. Mc Garrigle (Biomedical Engineering, NUI Galway) for the helpful discussion on the bioreactor.